The Rundown: This band is so unknown that I can’t even find any information about them! You’d be amazed how many Rockabilly bands are named The Top Cats. So here’s the rundown on one of my favorite Swedish bands: They have 3 albums out, “Rockabilly Trash”, “FullThrottle Rockabilly”, and “Viva Las Top Cats”. Take ¾ cup rock, ½ cup blues, 1 cup jazz, 3 cups rockabilly and mix thoroughly. Place in oven at 350° for 1 hour and you have The TopCats. This is some great music. I wish mainstream radio was full of this stuff. If you don’t feel like getting up and dancing, there must be something wrong with you or you are really, really bad dancer. 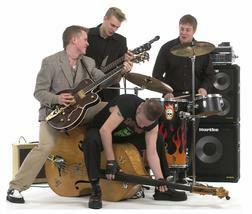 MarsBands.com is fans of Rockabilly bands, where ever they may be.